Red Fang have released a stream of their new track Not For You. It features on the band’s upcoming fourth album Only Ghosts, which is out on October 14 via Relapse Records. The follow-up to 2013’s Whales And Leeches was produced by Ross Robinson and mixed by Joe Baressi, with bassist Aaron Beam previously revealing that Robinson’s input encouraged the US output to experiment a little more in the studio. He said: “He really digs into the meaning behind the songs so that when you’re recording, you’re doing it with conviction and purpose. It’s less about the little technical things. 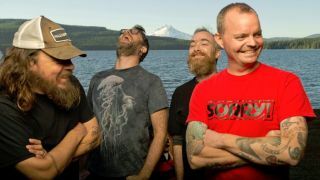 Red Fang previously issued the tracks Shadows and Flies from the album. They’ve just kicked off a European tour with Torche in support of Only Ghosts, which is available for pre-order direct from the Relapse website.